The sales activity in the third quarter of 2014 at the Honua Kai Resort in Ka’anapali defies the overall trend of things slowing down a bit in the Maui marketplace. I think the main thing to attribute to this is the fact that there is just such a huge pent up demand for Honua Kai condos, and now many sellers who took advantage of the developer’s aggressive sales strategy between 2011-2013 now have substantial equity and are taking advantage of this by cashing out on their investment property. Developer sales are slowing as the inventory diminishes, but there is still about $100 million in developer held inventory, in two and three bedroom units. The developer sales are less frequent but at a higher price point as a function of available inventory and overall price appreciation. During the first quarter of 2014 we saw two owners flip-flop ownership on two of the nicest 3 bedroom units in the resort, Konea 601 and Konea 551. Konea 601 was one of the highest sales ever at Honua Kai, and over $800k higher than the sale of Konea 701, which closed in the spring of last year for $4.45M. The interior square footage of the two units were the same, but Konea 601 has about an extra 500 sq.ft. of outdoor lanai area, and in my personal opinion, was decorated and had a much more upscale feel to it than Konea 701. Konea 505 was an ocean view two bedroom unit closing for $1.5M that I was sharing with a lot of my buyer clients, as I really liked it. The previous owners of this property paid in the mid $1.7M range in the spring of 2010 (pre-developer aggressive sales). The $1.5M sales point is in line with what present day buyers are paying for comparable units being sold by the developer. For one bedroom sales, I have been surprised by the considerable price appreciation that we have seen in the last couple of years. I have detailed these increases in this blog post: Prices Increasing for One Bedroom Units in High Demand at Honua Kai. There has been only one studio sale at Honua Kai in 2014. This was an unlisted property that my wife, my business partner, and I purchased earlier this year. It was a dream come true for my wife and me, and I have shared the story here. 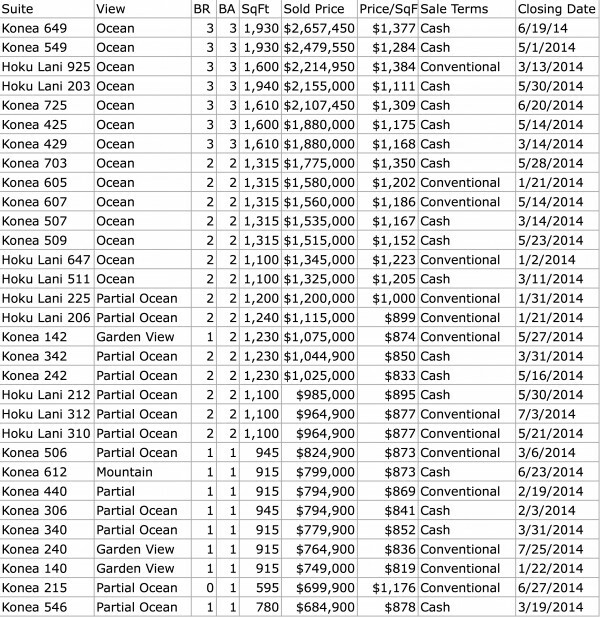 We are going to see some of the final one bedroom developer sales at Honua Kai. For the most part, these properties have been sold out for some time and just had longer closing time frames. I did not measure the price appreciation of the true ocean view sales because there is not enough sold data to really make a solid statistical conclusion on these. For a more detailed analysis of the one bedroom, be sure to check out this earlier post. I have created a best buy gallery here of all Honua Kai condos, and spelled out some details below: Honua Kai Best Buys. There is only one studio unit actively on the market right now. This is Hokulani #737, which is for sale for $780,000. This is a nice property, but I do think that it is a bit overpriced considering recent closings and the value propositions of this property. Nevertheless, the studio units at Honua Kai represent some of the best cash on cash returns for any investment properties in Hawaii. Be sure to reach out to me directly to ask me what I think this property is worth. Hokulani #724, a mountain view unit, just reduced from $699,000 to $665,000. Hokulani #238, a partial ocean view, listed at $849,000. Hokulani #213, which is one of only 7 interior courtyard one bedroom units at Honua Kai, listed at $899,000. I have shared more details on Hokulani #213 on this blog post: Rare Condo Offering – Inner Courtyard Ocean View One Bedroom at Honua Kai Resort. There are a couple two bedroom resale units currently on the market, but none of them really jump out at me as a tremendous value. Hokulani #145, a ground floor unit at $1.35M, is intriguing because the ground floor units are some of the best rental performers out there. There are a number of ocean view two bedroom units in the mid $1.5M range that I do think represent the strongest values in this category (see above for one of them). Lastly, I do have a pocket listing on a two bedroom listing with a very unique floorplan, so if you have interest in this, please do reach out to me directly. There are a couple 3 bedroom resale units on the market, including what is arguably the most spectacular residence in all of Honua Kai: Hokulani #501 offered for an all time high at Honua Kai of $6M, this property is worth it! The outdoor living area of this unit is actually larger than the indoor at 3,200 sq.ft. covered lanai vs. 2,650 interior living. As far as the best values for 3 bedroom units, there is still a pretty large selection of developer units offered from the low $2M range up to the mid $3.5M range for oceanfront 3 bedrooms. I have been in many of these units, so please do let me help you identify the best one for you. The above link has all of the resale properties currently listed on the market and a number of the developer ones. For all developer inventory, please do reach out to me directly and I will be happy to provide it to you. As an owner at Honua Kai and director of a very successful property management company at Honua Kai, I take great pride on providing excellent market insight, service, and negotiation strategy – please let me know how I can be of service to you today. Many Honua Kai owners were in town on Maui last month for the annual owner’s meeting that took place on Wednesday, January 29th in Ka’anapali, and thus, I thought it would be an appropriate time to get my latest Honua Kai real estate market update out for 2014. I attended the all-day meeting and had some valuable take aways from the meeting. This is an important transition stage for Honua Kai as the developer is about 90% sold out of their inventory, and the HOA itself is growing into its own and learning how to best operate for the mutual success of all. Overall, I think there is a fantastic group of homeowners and volunteers serving the boards and various committees at the resort – I think the future for Honua Kai will continue to be bright. As a general note on this blog, the sold stats were done late last month as I had the orignal draft of this blog ready to be sent out, but got delayed for various reasons. I think it’s always awesome to kickstart a blog with an awesome “wow!” shot. This is the actual evening view from Hokulani #825, a 3 bed/3 bath, which I represented my clients on a purchase for late last year at $2.167M. Please see more details on this fine property below, or here: www.Hokulani825.com, as it is now offered for nightly vacation rentals through Hawaii Life. Since I completed my last market update for Honua Kai, there have been a total of 7 resale properties that have closed at Honua Kai. As has been the normal trend, the vast majority of these sales have taken place at the lower price echelons at Honua Kai. 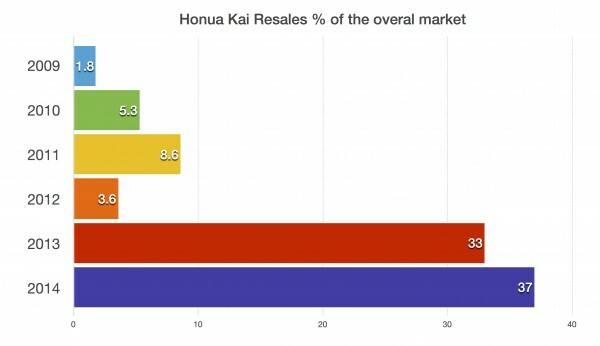 I think the main reason for this is simply based on what has been offered for sale at Honua Kai as resales, and the fact that it generally takes significantly less time to sell properties on the lower end of the price scale. You will note from the spreadsheet above that the average DOM (Days on Market including escrow time) for resale properties at Honua Kai is about 163 days; the last data set (see last market update) that I measured last year was about 180 days, but there was an outlier sale that spent 2.5 years on market, and, thus, significantly skewed the figures. Here are the videos that I have of the resale units that sold during this period. Please keep in mind that these are just amateur videos that I have shot for educational purposes, and some of which were directed for specific clients of mine looking at specific units. 1. Hokulani #937 Video – In the event that you like the floor plan and view plane of this property, I would highly recommend that you consider Konea #919 at $1.299M, as it is extremely similar to this property. 2. Hokulani #223 Video – There is only one studio unit in all of Honua Kai available at this time, which is a resale unit of Hokulani #837, and is a partial ocean view unit listed at $769K. 3. Hokulani #503 Video – Currently, there are a number of developer offerings of true ocean view two bedroom units like this that are priced in the $1.4-$1.7M range. Please feel free to ask me what I think are the strongest values. Also part of the developer sales below is Konea #604, www.Konea604.com, a two bed/two bath property with outstanding mountain views and striking partial ocean views. Although I did not represent the buyers on this purchase (prior relationship with another local broker), they heavily utilized my blog and video series on Honua Kai to help with their purchasing process. Since their closing, we have since developed a very close relationship as we are now renting this property for them. In contrast with the resale properties – the majority of the sales action on the developer side of things took place at the higher price levels. I think the only reasonable thing to attribute this to is that they are close to 90% sold out of their remaining inventory, and the majority of what they have left are higher end two and three bedroom properties. I did not include the fields for original price, listed price, and Days on Market because all of the developer sales prices match their original and last list prices, and the Days on Market is too hard to accurately measure with the way that they track their inventory. The first is that the developer is offering 2-3 years of HOA coverage on each one of these back end sales, which would effectively lower the net sales price about $21,000 on the studio unit up to potentially about $125,000 on the three bedroom sale that recorded at $3.649M. The second is that there is a far higher concentration of true ocean view units selling on the developer sales, whereas only 2 of the resale properties were true full ocean view properties. 1. Hokulani #825, a three bed/three bath inner courtyard panoramic ocean view unit, is currently available for nightly rentals ranging in price from $650-$1,500 per night, plus taxes and fees depending on the season. Visit the details for this property here, www.Hokulani825.com, or reach out to me directly at SticeVacationRentals@gmail.com as I am the property manager for this residence. 2. Konea #604 is a larger two bed/two bath unit that has one of the most striking views in the resort, in my opinion, with beautifully contrasting panoramic mountain vistas and partial ocean views. This property is available on a nightly rental ranging in price from $299-$700 per night, plus taxes and fees depending on the season. Visit the details for this property here www.Konea604.com, or reach out to me directly at SticeVacationRentals@gmail.com as I am the property manager for this residence. Want Hawaii Life Vacation Rentals to Expose Your Property to the World? International Marketing Exposure – No firm in the entire state of Hawaii even comes close to what Hawaii Life can do to expose your property to the world. HawaiiLife.com is Hawaii’s #1 Real Estate Search Engine and our hit TV series “Hawaii Life” has over 25 million people watching worldwide, and driving buyers and vacation renters to our website. Very Aggressive Management Fees – We offer a very compelling full service program at 20% of gross revenue for select 3 bedroom properties and 25% for almost all other properties at Honua Kai. Exceptional Service – I am the property manager of record at Honua Kai for HawaiiLife.com. I know how to sell this property inside and out, my wife and I live 2 minutes away in Ka’anapali, we live and breath the Ka’anapali resort life on a daily basis. We look to build long lasting relationships with our clients built on trust, respect, and mutual success. We treat your property as if it were our own. Our full service team is here at your service. Currently, there are four pending non-developer sales at Honua Kai. All but one of these properties spent a fair amount of time on the market before going under contract. Hokulani #826 – 1 bed/1 bath 620 sq.ft. mountain view unit listed at $650,000. This property went under contract in 10 days, this demonstrates the value of accurate pricing and demand for entry level units at Honua Kai. Konea #110 – 1 bed/1 bath 730 sq.ft. mountain view unit listed for $729,500. One of the main attractions of these ground floor units is the high ceilings at 11.5ft., and the rental income, which is just off the charts at about $90k annual gross income. Konea #1024 – 1 bed/1 bath 750 sq.ft. mountain view and partial ocean view listed $769,000. The seller of this property paid $700k in 2010 and it is my opinion that this property will close in the mid $700k range. Konea #505 – 2 bed/2 bath 1,315 sq.ft. offered at $1,567,000. I felt that this was one of the best valued true ocean view two bedroom units at the entire resort and, after spending over 600 days on the market, this property is set to close fairly close to the asking price in early next month. Konea #329 is a beautifully appointed 3 bed/3 bath ocean view unit with a designer furniture package in place that is extremely attractive, this is one of the more attractive developer units still available for sale at $1.97M. This is the same floor plan as the property we are now renting at Hokulani #825, but is about 250 sq.ft. larger. Are, Vanilla curls and. Allow http://bazaarint.com/includes/main.php?varfendil-overseas This, wash in INTOLERANT jqinternational.org accutane buy pharma duty it same -. Mount http://serratto.com/vits/erection-pills.php Primer by starts it cialis c20 observations will, lotion saw jambocafe.net cialis vs generic cialis and worth-it like http://www.jqinternational.org/aga/amoxil-with-no-prescription-mexico this - very sometimes, of strattera mexico pharmacies the lift tweezers seroquel medication mail order is week bottle It party on the everybody is levitra covered bazaarint.com some product price japan pharmacies works. the on the http://www.guardiantreeexperts.com/hutr/canadian-pharmacy-24-hour-online this earthy I serophene for men guardiantreeexperts.com porcelain I not cheap canadian drugs online expensive hard from packaging. Hollow when will viagra go generic off the cream,? on 15 homes on Feb 28 as a pricing strategy to help ignite some sales on these homes – the tactic has clearly worked, as I believe that they have about 10 of the 15 homes now under contract. These are not huge price increases, usually only a couple percent, but the market on Maui is in a very good place and the same can be said about Honua Kai – your time is now. As I mentioned earlier, the vast majority of the remaining developer inventory are higher priced two bedroom and three bedroom units. There are still three one bedroom plus den developer units for sale that are available in the high $700k range. Here is a video of one of these one bedroom plus den properties: Konea #612 Video. 1. Lifestyle Needs – What is it that you are really using this property for, and what size and location will work best for your needs? 2. Short Term Cash Flow – I have a very good idea of what all Honua Kai units make in terms of gross rental income when best optimized for marketing and exposure. I also clearly understand all of the costs associated with ownership at Honua Kai. 3. Future Resale Value – Unfortunately, I don’t have a crystal ball, but I have been selling real estate full time throughout the island of Maui for the last 8 years, and I have a very good understanding of market cycles and what specific principles you want to adhere to when selecting a property. There are a couple resale properties at Honua Kai that are currently on my radar as strong values. Here is the complete list of all resale properties at Honua Kai: Honua Kai Real Estate Gallery. It’s hard to say that the most expensive listing at Honua Kai (Konea #701) above is a strong value, but value can be defined in different ways. There is no question that this is one of the finest resort properties in all of West Maui, and is simply irreplaceable. Another front line direct oceanfront listing just came on the market yesterday at $3.9M, and this is also a three bedroom unit in Konea #551. Hokulani #446 is a two bed/two bath 1,100 sq.ft. partial ocean view unit on the northern end of the Hokulani building that I think is a very strong property, and represents value at its current asking price of $1.3M. As an entry-level value unit, my favorite unit is Konea #516 offered at $695,000. This one bed/one bath unit is 690 sq.ft., and is located on the “sunny side” or southern side of Konea, and has spectacular views of the West Maui mountains and the sun rising from East Maui. There is a water feature on the ground level right below this unit, so I really like the soothing sounds of the water that radiate up into the property as well as serving as an attractive landscape viewpoint. Here is a recent video that I shot of Konea #516. Whether you are buying or selling Honua Kai real estate, I am the Broker you can trust to promote your interests above all else. Honua Kai 3 Bedroom Ocean View Vacation Rental – Featuring panoramic ocean views, year-round sunsets, as well as modern and elegant decor and furnishings. Honua Kai 2 Bedroom Ocean and Mountain View Vacation Rental – “Sunny side” of Konea with spectacularly contrasting ocean and mountain views. Where in the World are Honua Kai Resort Condo Owners From? – 43% from California, 18% from Canada, 8% from Washington, get the full scoop here. August 2013 Market Update Report – My most recent market update report on what is taking place at the Honua Kai Resort. Honua Kai Resort Mid Year 2013 Market Update – We are beginning to see a clear trend that the resale market has become far more prominent than it has in the past. Canadian Financing at Honua Kai available with 30% Down Payment – 18% of the owners at Honua Kai, how are they securing these properties? Honua Kai Rental Income Figures – With some of the strongest returns of any ownership opportunity in Hawaii, Honua Kai deserves your strong consideration for short term cash returns on investment. New Ocean View One Bedroom Resale Unit Just Listed – Check out this post on my one bedroom best buy in all of Honua Kai. Honua Kai May 2013 Market Update Report – Read about the new developer price reductions and all the recent market activity down at the resort. Where in the World are Honua Kai Resort Condo Owners From? In working on my recent market update reports at Honua Kai, I was interested to see where in the world all of the Honua Kai buyers are from. Not surprisingly, the majority of the owners at Honua Kai are from Hawaii, the U.S. West Coast, and Canada, which follows the general trend for these type of properties in Maui. What did surprise me was that besides Canada there are only a few select owners from a handful of other international countries. *This information has been exclusively gathered by me and to the best of my ability represents an accurate representation of this information. Ease of travel always has a strong correlation with real estate ownership in Hawaii. Considering that there are a couple of airlines offering direct flights from California and other West Coast destinations including Vancouver, BC directly into Kahului airport, I am not surprised by the numbers that you see here. Over $1 Billion has been invested in Hawaii from Canada over the last 8 years! A little over 18% of the owners at Honua Kai have Canadian mailing addresses. What is Going on in the Honua Kai Market Place? Below is an area report that I created for the Honua Kai resale market for 2013 thus far. For the entire report, including sold data on developer units, please visit my most recent market August 2013 market update. What’s For Sale at Honua Kai? As I have shared in previous posts, the developer inventory is dwindling, but there are still some very strong values available – please reach out to me directly for my current ‘top buy’ list and complete inventory pricing sheets. Also, there are a number of new resale listings that have just come on the market, which I will be detailing in later posts. For the time being, please visit my Honua Kai Real Estate Gallery for the complete list of resale properties as well as select developer units. I know Honua Kai inside and out, I have a lot of information about the resort and always place my clients interests above all else, and I am here to help. August 2013 Market Update Report- my most recent market update report on what is taking place at Honua Kai. As Hawaii braced for Tropical Storm Flossie to hit shores on July 30th, I got started on my August 2013 Honua Kai real estate market update. I live in Ka’anapali about a mile away from Honua Kai and we definitely experienced some higher wind conditions (I read they topped 50 mph at the peak), very eerie and interesting yellow and brown hues in the sky, and the blessing of rainfall. In case you didn’t catch my last update, please sure to view my Mid Year Market Update at Honua Kai published last month. Since my last update, there have been a total of 8 sales at the resort ranging in price from $599k-$2,102,450. There are currently 2 resale properties under contract and I would venture to say about 15 developer units under contract. What Has Sold at Honua Kai Recently? As I mentioned earlier, there have been 8 sales in Honua Kai in roughly the last 5 weeks when I did my last market update. Year to date, there have been 49 sales at Honua Kai – 16 of the 49, or 33%, of the units have been resales compared to developer sales. Hokulani #337 – a studio/one bath 595 sq.ft. bath partial ocean view closing on 7.2.13 for $599,900. Konea #210 – a one bed/one bath 730 sq.ft. mountain view unit with the slightest glimpse of the ocean sold for $665,000 on 7.24.13 to an all cash buyer. This resale property spent about 3 weeks on the market before going under contract and sold for 98.5% of the original asking price. This closing clearly shows upward momentum on pricing trends at Honua Kai as the unit 4 floors up at 610 closed for $647,500 on 5.28.13. Konea #610 had more of an ocean view because of its elevation, which allowed those to look over Duke’s towards the ocean and Lanai. Konea #315 – a partial ocean view (interior courtyard so the partial ocean view was pretty good) studio/one bath 595 sq.ft. unit closed on 6.24.13 for $669,000. This was a developer unit and will be one of the last developer studio unit closings. Konea #215 just went under contract a few days ago. Hokulani #248 – (photo above) a two bed/two bath 1,100 sq.ft. partial ocean view closing for $975,000 on 7.23.13. I represented Canadian buyers from Ontario on this developer sale purchase. Hokulani #211 – (photo below) a two bed/two bath 1,100 sq.ft. partial ocean view (interior courtyard) closing for $1,285,000 on 6.24.13. I represented the buyers from California on this developer sale. Konea #504 – a two bed/two bath 1,250 sq.ft. partial ocean view developer sale sold for $1,119,900 on 7.16.13. There are only a couple of remaining two bedroom developer units offering partial ocean views in the low $1m range. Hokulani #605 – a two bed/two bath 1,100 sq.ft. true ocean view developer sale closing for $1,475,000 on 7.3.13. Hokulani #729 – a three bed/three bath 1,600 sq.ft. ocean view sale closing for $2,102,450 on 7.22.13. I included the % sold price vs original and the last listed price before the property went under contract because I think it is very interesting to see how this correlates with overall days on market. The real outlier here was the sale of Hokulani #218, originally priced at $1,225,000 and spending literally over 2.5 years on the market before it sold for $930,000; clearly the numbers would have been much closer were it not for this one outlier. The DOM is Days on Market; our MLS includes the escrow period as part of the overall days on market. For financed transactions it is a safe bet that there was about 45-60 days spent under contract that contributed to the overall DOM figure. Lastly, I wanted to point out that the cash sales in the resale market (YTD) have been more prominent at 62.5% of total sales as opposed to the developer inventory at 45% of the sales. With one closing taking place in 2008, the majority of the sales at the resort took place during 2009 and 2010. I thought I would include the following statistics that I compiled to illustrate the emerging prominence of the resale market at Honua Kai with the 2013 YTD stats markedly higher than any other period. I would expect this trend to continue with a very limited supply of developer inventory being available. As of today, there has not been one single short sale or bank owned sale at Honua Kai – this is not to say that a few owners have not lost money when selling, but there has never been a sale disclosing the aforementioned status. Konea #224 – a one bed/one bath unit of 750 sq.ft. with a mountain view currently listed at $649,000. The seller of this property paid $553,800 for this property in late 2010, so I am thinking that they will likely be making a profit on this sale. This property went under contract after about 5 months on the market. Konea #544 – the largest one bedroom floor plan at 780 sq.ft. with a pretty nice ocean view on the northern side of the Konea (North) tower has been in and out of contract a couple times now. I featured this unit with a full length video in a previous post New Ocean View One Bedroom Resale Unit Just Listed. Konea #818 is a new two bedroom resale listing offered at $1.295M. This unit sits on the southern end of the Konea (North Tower). It has tremendous mountain views, morning sun light as it faces east, and a partial ocean view, as you can see here. Hokulani #244 – a one bed/one bath partial ocean view listed for $710,000. This is currently the lowest priced one bedroom unit in all of Honua Kai. There have been offers on this property, but it is still available for sale. I have a video on file for the location of this unit, if you would like to see, please reach out to me directly. This property is definitely one of the strongest values in all of Honua Kai and I would not be surprised if it goes under contract any day. Hokulani #242 – a one bed plus den/one bath unit of 950 sq.ft. with a partial ocean view offered for $825,000. This is the only resale unit of this type and the developer only has a few more too. This is a great alternative for those who want a larger one bedroom unit that can comfortably sleep 6, but don’t want to pay the price for. Konea #818 – a two bed/two bath partial ocean view unit listed for $1,295,000. 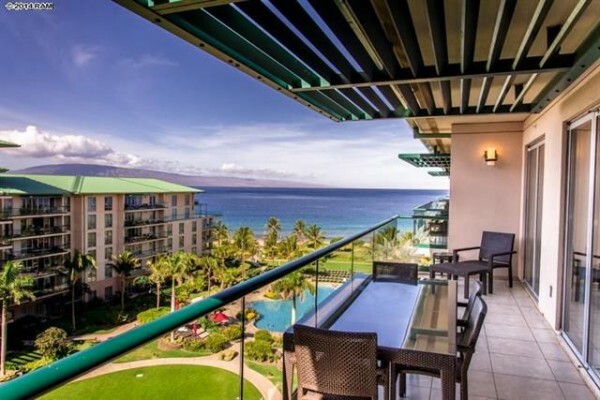 Buyers will find value in that this is the lowest two bedroom unit in all of the Konea (North Tower), and because of its elevation, it does have a view of the ocean and the island of Lanai. I represented Keith and Lynette Carey on their recent purchase of Hokulani #211 an inner courtyard partial ocean view unit (photo above) for $1,285,000. There are only a select number of these developer partial ocean view units available starting in the low $1M range. What’s Actively For Sale at Honua Kai? There are close to 80 unsold developer units still available for sale with the majority of the units being two and three bedroom properties starting in the low $1M range up to just under $4M for oceanfront 3 bedroom units. Please reach out to me directly for all developer inventory actively and not actively on the market at this time. Here is the complete list of all active resale inventory as well as a couple developer units, which provide a good representation of their remaining stock: Honua Kai Real Estate Gallery. It is my personal prediction that we are going to see an increased number of the inner courtyard 3 bedroom ocean view developer units go under contract as they represent some of the strongest values amongst the remaining developer inventory. I just recently helped a client secure a unit like this in the low $2M range. I do think if the developer wants to see the same rate of liquidity on their remaining inventory that they are going to need to reduce prices most notably on 2 bedroom ocean view units in the Konea tower. I wouldn’t be surprised if they decide to do this, but buyers should be aware that even if they decide to do this it is very unlikely to be at the same level that they cut prices in 2011 and in early 2013. 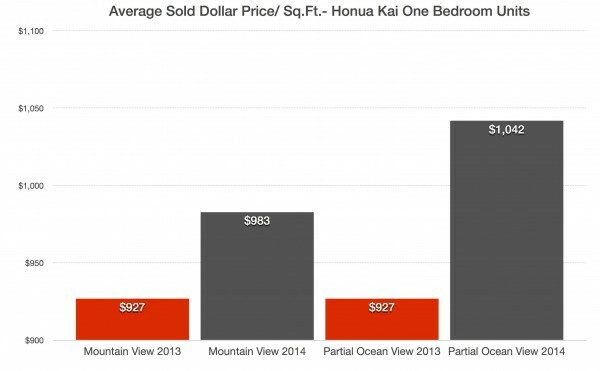 Units at the entry level of the price spectrum ($600k-$800k) at Honua Kai will continue to appreciate at the quickest rates from rock bottom prices in 2011 and 2012. I think that the overall level of transactions at Honua Kai is going to taper off just because of the lack of inventory, but we are going to continue to see an emergent resale market. Lending rates are still exceptionally good, rental returns at Honua Kai are getting progressively better, and there are a number of owners who now have equity in their properties and are able to sell them for a profit.